If you are a Windows software developer and/or distributor, then, by all means, you are well aware that you should always digitally sign your software, so that a minimum level of accountability and trust can be established between yourself and your users. As you should also know, this process is usually accomplished by acquiring a Windows Authenticode credential (a credential is a certificate + its associated private key) which can then be used to digitally sign binary executables. However, one must also consider the security aspect of the signing process and realize that, given the faintest opportunity, ill-intentioned people will try to grab your code signing credentials, if they can. For instance, perhaps you are already aware that the NSA's stuxnet virus was signed using credentials that were stealthily duplicated from JMicron and Realtek, and that, outside of state sponsored endeavours, malware authors are also exceedingly interested in acquiring data they could use to steal the identify of a trustworthy person, even more so if that person or entity is producing popular software. This means that, should malware find its way on your development machine (as part of an infected development tool for instance which malware authors are likely to target if they can, as it can mean a huge payoff), it'll most likely be able to steal BOTH your credential and its private key password, since one can only expect semi-competent malware to implement both a disk scanning and a keylogging facility. As a result, it doesn't take a paranoid person to realize that storing credentials on disk, even if it's a removable USB flash drive, that you only plug when signing binaries, is a very very bad idea. Similarly, if your alternative is to store your signing credentials into the Windows certificate store, and expect that it'll be enough, you should probably realize that the level of a software-only security solution on Windows goes about as far as the distance you can throw a chair... with Steve Ballmer sitting on it. Thus, what you really want, is have your credentials stored on a dedicated removable device, that's designed precisely to protect that kind of stuff. 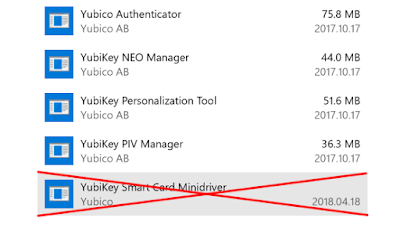 And this is where FIPS 201 Personal Identity Verification (PIV) devices, and especially the convenient and relatively affordable YubiKeys from Yubico come into play. 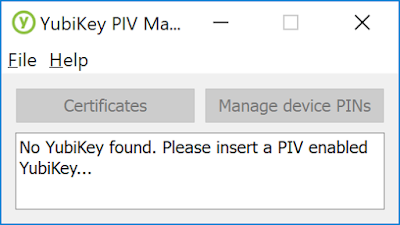 For the record, most of the process described below can likely be applied to any FIPS 201 PIV device, but since YubiKeys are what I use, I'll focus only on YubiKey usage. Any YubiKey model EXCEPT the FIDO U2F Security Key. 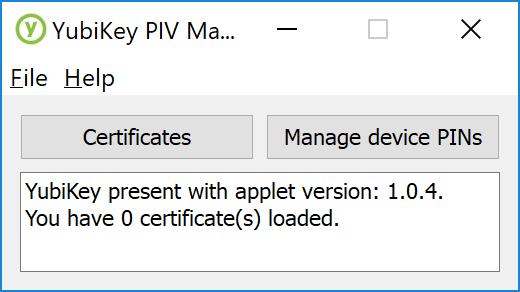 My preference goes for the YubiKey 4, but anything that has the PIV feature will do. The latest version of YubiKey PIV Manager, which you should download and install from here. 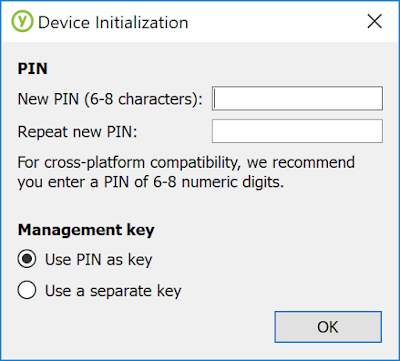 Under "Management Key" you should keep the "Use PIN as key" option checked. 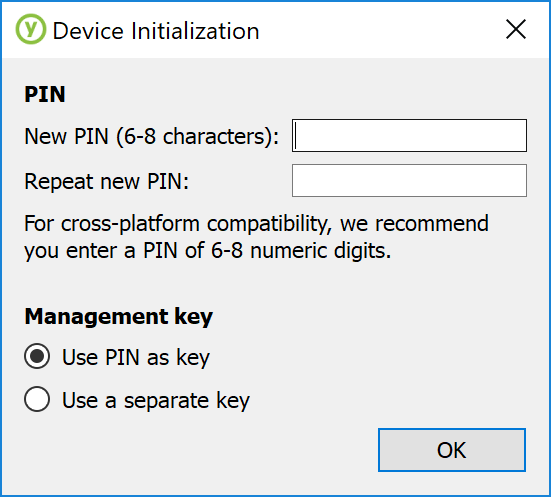 On the other hand, since you're going to use that key for code signing on Windows, you can disregard the cross-platform compatibility recommendation, as I haven't seen any issues with using a PIN with extended alphanumeric characters on Windows, and, with a length of 8 characters, the PIN is already short enough as it is. One thing I should point out is that, just like with a credit card, the device only gives you 3 attempts at entering the right PIN before locking itself (which is exactly what you want from a device that stores valuable data) so keep that in mind when you use it. Of course, a YubiKey can always be reset if locked, but you will lose access to the credentials stored on it. Click "Import from file" and select your .p12 code signing credential. You will be prompted by a password, which of course is the password for the private key of your .p12 (and not the key's PIN). If you are producing Windows software that still needs to target platforms like Vista or XP, you might be saying: "That's all very well, but what if I need to sign my software with both an SHA-1 and SHA-256 Authenticode credential? There's only one Digital Signature slot on the YubiKey after all..."
Well, the thing is, this is one of the exact issues I have been faced with for Rufus, and I can tell you that, as far as code signing is concerned, the labels assigned to the certificate/credential storage slots are pretty much irrelevant. 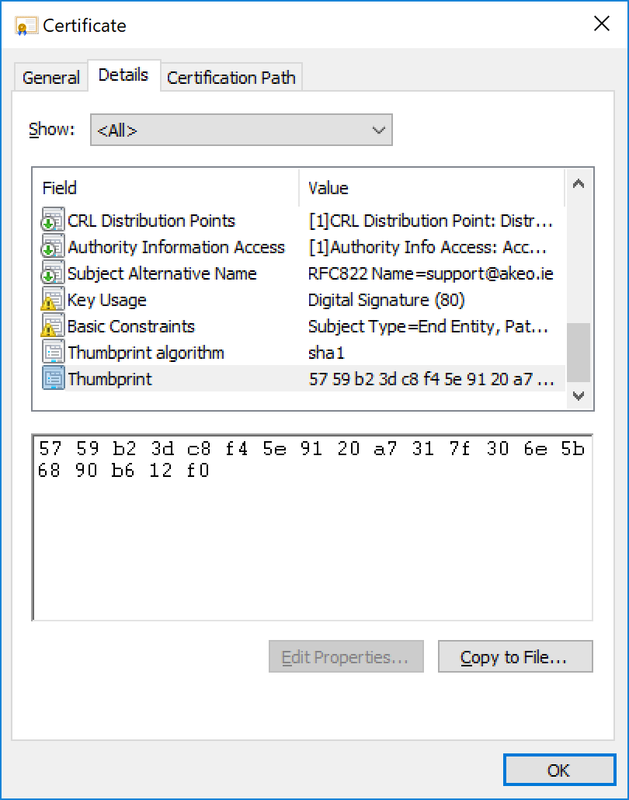 You can use any of these 4 slots to store any code signing credential you want (since they are referenced by their fingerprint), and we only used the "Digital Signature" PIV slot because that's the one that makes most sense for storing a code signing signature. However, if you also want to store an SHA-1 credential, you can use any of the remaining slots to do that. 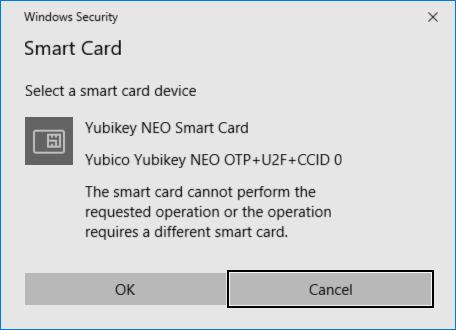 My preference is to use the optional "Card Authentication" slot to store your extra SHA-1 credential (so that you can use the "Authentication" and "Key Management" for actual authentication or key management if you ever need to). At least, this is what I have been doing for double-signing my Rufus application, and neither SignTool or the YubiKey seem to have any trouble with that. Okay, so you have your code signing credential(s) safely stored on a secure YubiKey. Now what? Clearly you can't use SignTool in the usual fashion, where you reference a local .p12 or .pfx file. 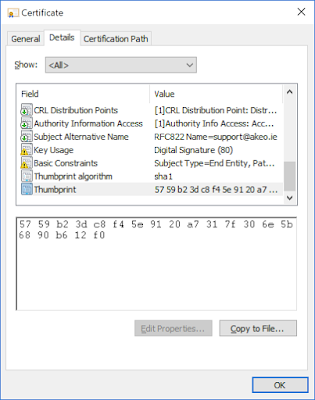 Instead, and especially if you have multiple code signing credentials residing on it, because the YubiKey is automatically detected as a credentials storage device by Windows, what you want to do is reference your credentials by their unique SHA-1 fingerprint in SignTool, and let Windows/YubiKey handle the rest. This is exactly what the /sha1 flag of SignTool is for. However, before we can do that, we need to figure out the SHA-1 fingerprint of your certificate. Now you can use SignTool with /sha1 instead of /f and when you do so, you will be prompted to plug your YubiKey (if it isn't plugged in) as well as your PIN, which, if you enter successfully, will enable the signature operation. IMPORTANT NOTE: Do *NOT* let Windows install the Yubikey Minidriver as part of Windows Update! Once you have done that, you should find that you can use your Yubikey for signing applications again. Or, if you want to use the MiniDriver, you can follow the steps highlighted here. 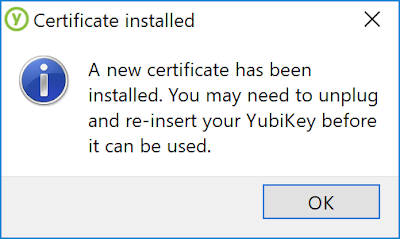 Now that you've seen how to do it, I would strongly urge you to go and purchase a YubiKey (or any other FIPS 201 PIV device) and NEVER, EVER again store code signing credentials on anything else than a secure password protected device that was designed precisely for this. This means that, once you have done all of the above and validated that it works, you should DELETE your .p12/.pfx and remove any trace of your credential(s) from your computer. Of course, if you are really worried, you may still choose to store a copy of said credential(s), on a backup CD-ROM (preferably in a password protected archive), that you'll only store in a locked place. But by all means, if you have a working YubiKey, you should not let your code signing credential(s) anywhere near any of the computers that you own! Unlike what I was led to think, and despite the relative failure of Windows RT (which was kind of a given, considering Microsoft's utterly idiotic choice for its branding), it doesn't look like Microsoft has abandoned the idea of Windows on ARM/ARM64, including allowing developers to produce native desktop Windows applications for that platform. However, there are a couple caveats to work through, before you can get Visual Studio 2017 to churn out Windows native ARM/ARM64 applications. 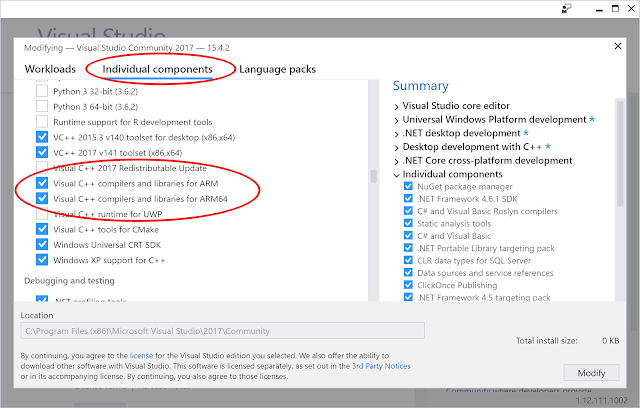 It is important to note that you will need Visual Studio 2017 Update 4 (version 15.4) or later for the ARM64 compiler to be available for installation. 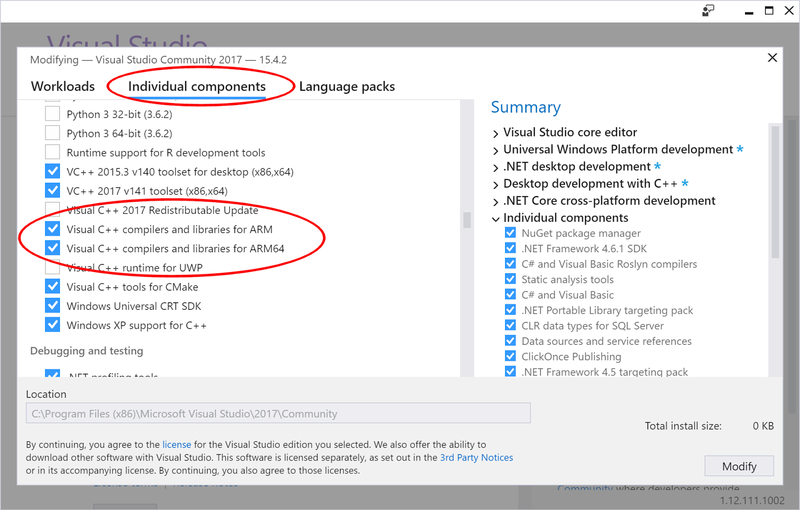 ARM64 was silently added by Microsoft late in the Visual Studio 2017 update cycle, so if it's ARM64 you are after, you will need an updated version of the Visual Studio installer. Caveat #2 - Error MSB8022: Compiling Desktop applications for the ARM/ARM64 platform is not supported. Toolset.targets(53,5): error MSB8022: Compiling Desktop applications for the ARM platform is not supported. Short answer is, Microsoft doesn't really want YOU to develop native desktop ARM/ARM64 applications. Instead, they have this grand vision where you should only develop boring, limited UWP interpreted crap (yeah, I know the intermediary CIL/bytecode gets compiled to a reusable binary on first run, but it is still interpreted crap - I mean, if it is so great, then why isn't the Visual Studio dev env using it? ), that they'll then be able to provide from the App Store. God forbid, in this day and age, you would still want to produce a native win32 executable! 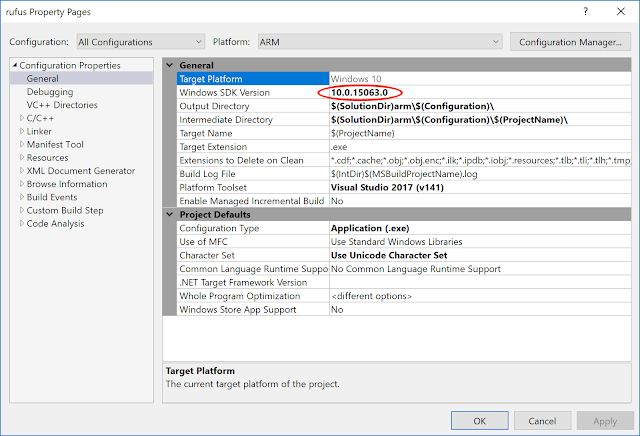 Be mindful however that the default SDK that Visual Studio automatically installs if you select the C/C++ components is not full-featured, and will be missing important libraries for ARM/ARM64 compilation, so there again, you must go to the individual components and explicitly select the SDK you want, so that the full version gets installed. With all the above complete, you should now be able to join the select club of developers who are able to produce actual native Windows applications for ARM/ARM64, and this just in time for the release of Windows 10 on ARM64.